Next march I am going to Italy and Greece for a trip to see the sites with my girlfriend. I was wondering what the average price for an Italian Rapier and Gladius would go for. I am extreamly interested in looking at these prices because I plan on buying either a well made gladius or Italian Rapier. If anyone would know what these prices would be in Italy it would be much apreciated. You're asking for a general pricing structure not a specific item. As such you post fits better here in the Off Topic Forum. Good luck and enjoy your trip! No trouble at all Josh. Well, I don't think that Italy is actually the best place to find a well-made example of an historical Italian rapier or gladius--there are many excellent makers all over the word (I can think of several in the US and Bohemia & Moravia, for example). Honestly, in most places the quality of item that one would pick up in a shop open to tourists is not likely to be very good. But as to prices, for a well-made rapier I can't see making out for less than $500 in the US, and probably not less than $1,000 in Europe. That's really guesswork, though. My own thought would be to just go and enjoy the ambience of the countries you visit, pick up some trinkets to take home, and when you get home give thought to investing in a nice piece. But that's just my thought. And it is possible to get lucky. One of my co-workers was in Bohemia when he discovered a little shop which made display armour to order. For $1,000 he could have had a very attractive suit of Gothic armour. Sure, it probably wouldn't have been able to withstand a good sword-blow--but it would have made an amazing conversation piece. Sadly, he didn't buy it, even at his wife's urging, and he's been kicking himself ever since. Of course there's Del Tin in Maniago but since they ship to the U.S. you probably wouldn't gain much by buying a rapier or gladius (not sure they even make gladii anymore come to think of it)there. I would definitely visit the shop if you have the opportunity though!!! 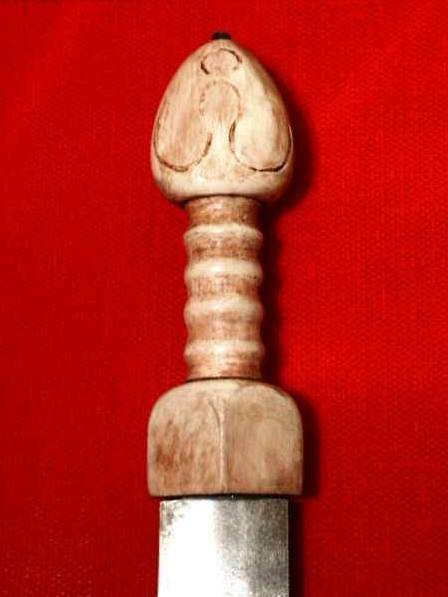 Seeking a quality Gladius or Rapier in Italy or Greece will be a challenge. To my knowledge there are no custom swordsmiths of consequence active in those countries today. In Italy sharp swords are even illegal to make. You have Fulvio Del Tin in Italy that makes the well known production replicas, but his products are well catrered for with retailers already. My advice to you is to focus on museums and historical sites to get a good feel for the place where history actually happened. Enjoy good food, good wine and sites steeped in history. You will find much of that and it is well worth seeking out. If you get to visit musuems you might develop a deeper understanding for the real nature of historical weapons from preserved originals and depictions in art. May your trip be rewarding and most enjoyable! Remember to sample good italian winen and make sure you try a decent Amarone! Living in the UK and travelling many times a year in Europe I would second the comments by Peter and others above. Although fencing (which is where I got my initial interest in ancient arms) is still a popular sport, and there are many collectors of antique swords (I collect antique rapiers and smallswords), the production of and market for good quality reconstructions is fairly limited. There are the odd small specialist smiths in the UK but on the continent they are few and far between. As mentioned above many tourist sites have shops cashing in on the history with cheap swords (Toledo being the worst abuser of its fine heritage in that respect), the quality is abysmal, as you would tell from a glance. Unless you want a 'rapier' that probably weighs in at about 6lbs, has the tensile strength of a ripe banana and is covered with kitch gilt with 'D'Artagnan' etched in Arial Font size 24 on the forte, I would steer clear and instead enjoy a cup of coffee and a couple of shots of Zivania with your lady in a sunny cafe and worry about quality edged weapons when you're home (in fact Greek coffee would probably melt most of their tourist blades). Also tramping around searching for swordsmiths might not be your girlfriend's idea of a Europe trip ! You'll spend at least a day in Rome looking at shoes but the door doesn't swing both ways in my experience. What you should do as Peter said is take advantage of the museums and the original historical pieces. Those we have in abundance in Europe and you should take the opportunity to visit them in detail (and pick up the catalogues for later study). I was reminded of how good Europe is in that sense last weekend by being able to be confused by a description of two rapiers in a book by Oakshott and taking a 15 minute stroll across Regent's Park to the Wallace Collection to look at them 'in person'. Use the resource while you're there is my advice. And do all the historical sites. Things like the Colisseum really are amazing. I can give tips on classical sites if you want any pointers. Thanks Bill and Nate, I should have definitely remembered the new gladii from Del Tin at least! Sheesh... What can I say last night I was being too lazy to go look at the site to check for gladii.... I guess I tend to get more focused on other styles of swords. I still wouldn't pass up the chance to visit Del Tin if given the chance though.